Northern Ireland defender Jonny Evans is in a race for fitness ahead of the World Cup play-off against Switzerland. 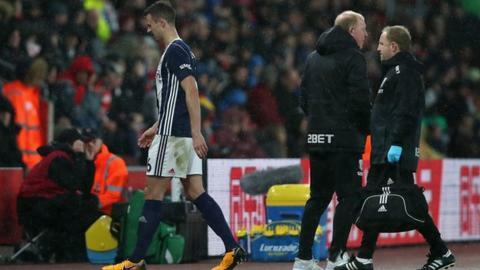 The West Brom centre-half came off in the first half of Saturday's 1-0 defeat at Southampton with a groin injury and will have a scan on Sunday. West Brom manager Tony Pulis said: "obviously everyone in Northern Ireland will be concerned about Jonny, and we are a little bit concerned". Northern Ireland face the Swiss in a two-legged play-off next month. Manager Michael O'Neill will be sweating on the results of the scan with the first leg in Belfast on Thursday 9 November just 19 days away. The second leg in Basle is on Sunday 12 November.